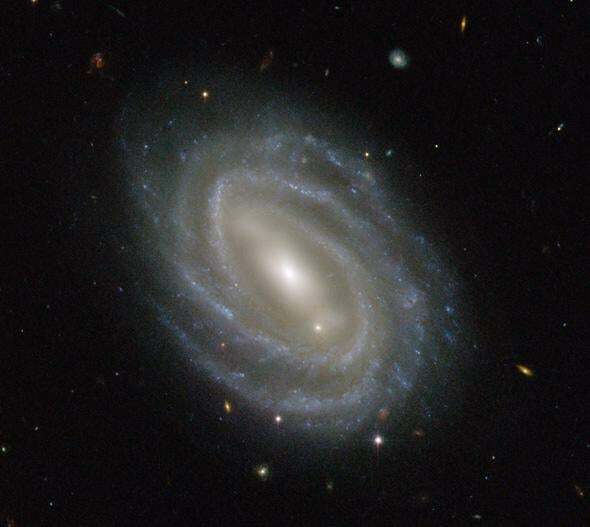 Weak gravitational lensing around a beautiful spiral galaxy. That galaxy is beautiful … but its reach far exceeds what we see here. The Universe is a bit bent. You’d think that light would travel in straight lines, going directly from point A to point B. But it’s more complicated than that. Space is curved, warped, distorted by the matter lodged within it. It’s hard for our puny three-dimensionally adapted brains to wrap themselves around (so to speak), but what we think of as space is actually a framework that can be bent. Mass does that bending, and we perceive that bending as gravity. But we can see the effects of this bending, too. Like a car following a curve in the road, light follows the gravitationally induced curving of space. We poetically call this effect “gravitational lensing,” because a lens bends light as well. Sometimes the curve in space is profound, like when a black hole makes a warp so severe it’s almost a puncture in the fabric of reality. The path a beam of light takes can be whipped around quite viciously—we call this strong lensing—or even plunge down into the black hole, never to return. Clusters of galaxies can do this as well, warping light from even more distant galaxies into bizarre shapes. Other times that curve is more gentle, when the mass is more spread out. Individual galaxies and some galaxy clusters are like that. Instead of an obvious distortion in the direction light takes, it’s subtler, only marginally changing the light’s path. Although harder to detect, this weak lensing can tell us a lot about the mass doing the bending of space. And that’s why astronomers used Hubble to take that lovely image of the galaxy PGC 54493 seen above. A closer look at PGC 54493. Lovely, isn’t it? That galaxy dominates the view, our eyes drawn to magnificent spiral arms, the bar-shaped distribution of stars in its center, the blue patches where massive stars are being born by the thousands. But it’s not the most important thing in this image. Look around it. See all the smaller, fainter galaxies? PGC 54493 is perhaps 500 million light-years or so away, but these other galaxies are much farther. The light we see from them was emitted when the Universe was far younger, and has traversed billions of light-years of space to reach us. On that trip, this light passed near PGC 54493, traveling through the region of space subtly distorted by the galaxy’s mass. The shapes of these distant galaxies thus get distorted, too, the amount of change in their shapes determined by the amount of mass in the big spiral galaxy bending space. 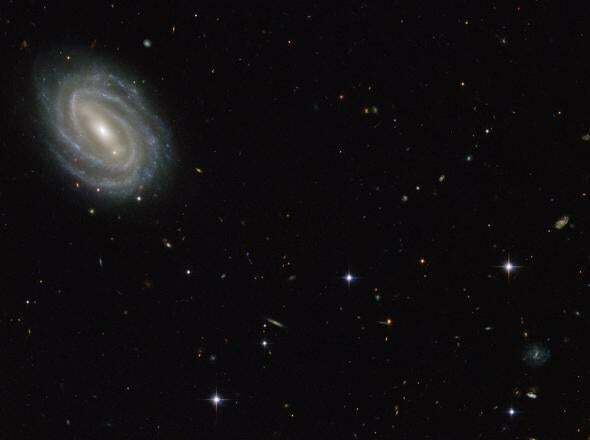 It’s difficult to determine that for any individual faint galaxy, but if you observe enough of them, you can show statistically how much they’re warped, and therefore where the mass of the intervening galaxy lies and how much there is. That is critical. We know that normal matter—the kind of matter that makes up you, me, the computer you read this on, and essentially every visible object in the Universe—is in the minority. Dominating the amount of matter in the cosmos is a mysterious form of it that we cannot see, but which has mass, and therefore gravity. Dark matter can’t be observed directly, but its gravity warps space, and that distorts the light from those distant galaxies, and that we can indeed measure. Astronomers have been mapping dark matter in this way for many years; perhaps most famously in the Pandora Cluster, which showed just how dark matter in clusters of galaxies can affect the light from more distant galaxies. They continue to observe other clusters to make even more maps of the distribution of dark matter in the Universe, and that’s why PGC 54493 was the target of these observations. Although bright and beautiful, it’s the dark reach of that galaxy that concerns us, invisible matter making invisible bends in space, distorting more distant galaxies in almost, but not quite, invisible ways. Sometimes the Universe is obvious, ostentatious, perhaps even gaudy. But other times it whispers, hints at us to follow the rules of math and science that shape it, and in so many cases it is following that path—distorted and subtle as it may be—that leads to seeing its underlying structures.